As a marketer, I've always been skeptical of social media ROI. As an academic, I want credible data proving solid results. Two years ago I wrote Forget the Hype! Some Hard Truths About Social Media. My overall conclusion was "implement a marketing strategy that creates real, measurable results. Be focused on what's profitable, not what's trendy". Two years later, I'm still not convinced you should invest the majority of your marketing budget on social media. I'm a small business advocate, and I know that your budget is extremely limited. You don't have the resources to throw money into any marketing campaign that doesn't have a positive ROI. Notice it says perceived benefits and not actual benefits -- that matters. It's not completely bad news and I'm not entirely against social media. My small businesses has had some great success with local Facebook marketing. But isn't it time we focus the majority of our marketing efforts on gaining real results and not what's trendy? One surprising leader in positive marketing ROI is out-of-home (OOH) advertising, which includes billboards and commercial locations. 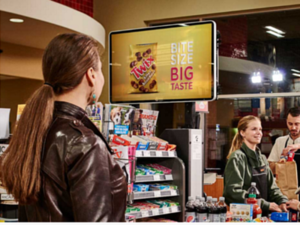 However, even this traditional marketing method is changing, as digital OOH is popping up in places like retail checkout lines. What's more impressive is that approximately 50% of adults say they have purchased the product, visited the product's website, or sought more information after seeing DOOH advertising. Impax Media, a DOOH advertising provider, say their clients have increased overall sales by an average of 31.8% and they have seen 32.8% increase in repeat buyers. Plus, 69% of consumers say they are frustrated with long checkout lines and 70.2% say they would watch these types of screens during their checkout. We all know that mobile usage is climbing. In fact, Intel is cutting 12,000 jobs because PC usage keeps falling. But did you know that over half of all mobile searches lead to a purchase? And 48% of these purchases start on mobile search, not apps, business websites or social media. Mobile shoppers are also focused, as 70% of mobile searches lead to action on a website within one hour of their search and 40% will choose another result if it's not mobile responsive. Google search is still an important marketing medium, and they have campaigns for mobile devices. Be sure to target mobile devices in any PPC campaigns. Consumers who receive marketing emails spend 138% more than people who don't receive email offers! Social media ROI isn't close to the effectiveness of email marketing. Period. ROI is really the only thing that matters in the marketing game. You shouldn't invest the majority (or even half) of your marketing budget into a campaign unless it can actually increase your bottom line. Social media isn't bad, wrong or even useless. It has it's place in our marketing efforts and certainly will for years to come. But keep your eye on the statistics and don't overlook other marketing methods. 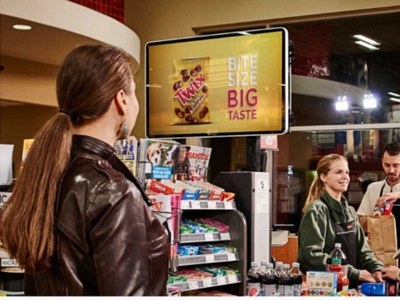 Advertise on digital screens in the grocery checkout? Sure, why not? They have better ROI than social media. And until that changes, keep your focus on the results and not what's popular or trendy.